Tomato, pepper, garlic chutney recipe - Chutneys are Indian staple food prepared almost everyday. Variations of chutneys are made to serve with breakfast and meal. 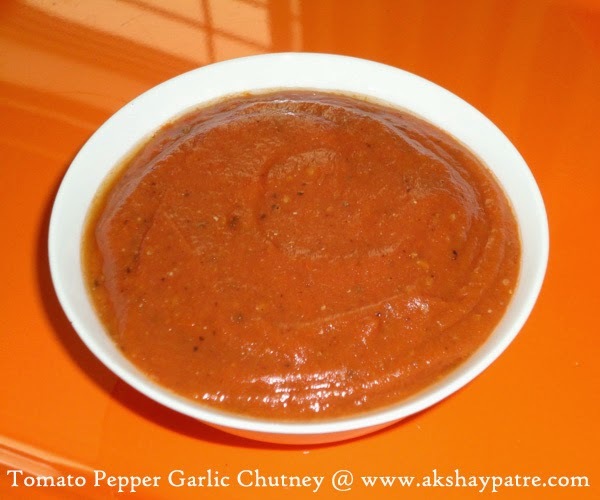 Today I have come up with another chutney recipe made with tomato pepper and garlic. I make this chutney often for parathas. This chutney is spicy and tasty with attractive vibrant red colour and goes well with roti, chapati, parathas and bread sandwiches. Tomatoes are rich in Vitamin C and is contain essential nutrients. Heat the oil in a pan and add the chopped tomatoes, black pepper, chilly powder, garlic and salt. Saute for 3 mins. Cook covered on low flame till the tomatoes turn soft and mushy. 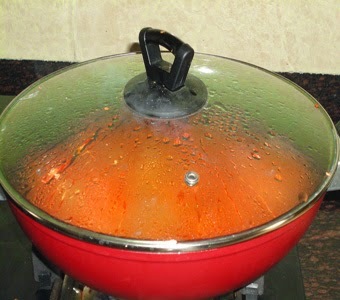 If it turns watery, open the lid and simmer till the tomatoes become dry. Once the tomatoes turn soft and dry, switch off the flame and cool it. Grind it to a smooth paste without using any water. Serve tomato pepper garlic chutney with roti, chapati, paratha and bread sandwiches. You can add green chillies instead of red chilly powder to this chutney. 1. 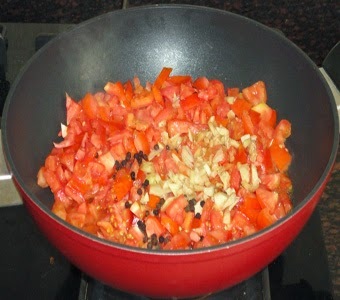 Heat the oil in a pan and add the chopped tomatoes, black pepper, chilly powder, garlic and salt. Saute for 3 mins. 2. Cook covered on low flame till the tomatoes turn soft and mushy. 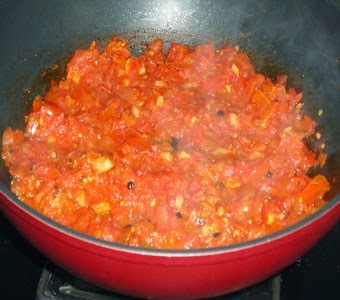 If it turns watery, open the lid and simmer till the tomatoes become dry. 3. Once the tomatoes turn soft and dry, switch off the flame and cool it. 4. Grind it to a smooth paste without using any water. 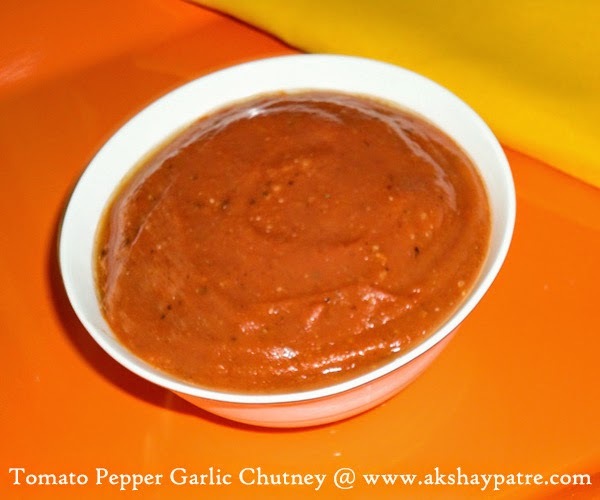 Serve tomato pepper garlic chutney with roti, chapati, paratha and bread sandwiches. Love this flavourful chutney, can have two more parathas with this chutney. Nice chutney. I do this chutney with similar ingredients with the exception of grinding. Will surely try your way next time. Thank u so much Shobha. Try my version and let me know how it sounds.